Do your beliefs limit you? Home » The Tony Robbins Blog » Mind & Meaning » Do your beliefs limit you? What is a belief? It’s a feeling of certainty about what something means. Beliefs create the maps that guide us toward our goals and give us the power to take action. The challenge is that most of our beliefs are generalizations about our past, based on our interpretations of painful and pleasurable experiences. Often we are unconscious about what we believe and how those beliefs affect our actions. Our limiting beliefs can cause us to miss out on the things that we want most and our empowering beliefs can drive us toward to the life we want to live. What is a goal that you have always wanted to achieve and haven’t? Why haven’t you? Whatever your reason, there’s always a limiting belief. 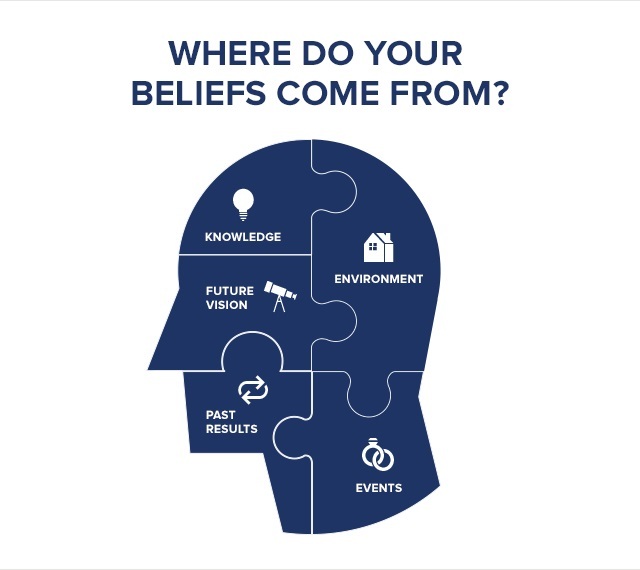 The first step in replacing old, disempowering beliefs with new, empowering beliefs is to understand the five places our beliefs come from. The day you got married. The birth of your child. That big promotion. The death of a loved one. Even terrorist attacks. Events impact our lives profoundly causing us to form beliefs, often unconsciously, which affect our entire worldview. Can you think of an event that has impacted you in a positive or negative way? Knowledge is not power. Knowledge is potential power. Applied knowledge is a dynamic tool in knocking down the walls of limiting beliefs. Become a life-long learner, and seek out knowledge with laser focus. Put yourself in proximity with people who know more than you do. Proximity is power! Model the best and learn from their experience and you can create the beliefs that will compel you to succeed. We all create beliefs around the results of past achievements or failures. But past results do not equal future results. Build certainty and confidence by building on successes, even small ones. Stack positive results in order to believe you can achieve what you set out to do. Just as past experiences impact your beliefs about what is possible, so does your imagined experience of the future. It is absolutely essential that you create a compelling future. No one else can do this for you. Prime yourself for success by first taking a few minutes to visualize your success. Then make it compelling by writing down the reasons you MUST make it that way. Imagine the way you will feel if that is your future. Finally anchor this in your body by standing up and celebrating!